Francesco Melanzio worked almost exclusively in his native Montefalco. The house in which he lived (illustrated above) survives outside Porta Camiano (see the Walk). His early work suggests that he had been a student of Fiorenzo di Lorenzo. He became the master of his nephew, Febo Melanzio. A surviving document records that Pietro Paolo di Giovanni Marino commissioned this panel from “Francesco pentore” in 1486. The inscription along the top of the frame again records Pietro Paolo di Giovanni Marino, and gives the date 1487, while the inscription at the bottom identifies the artist as Francesco Melanzio. It is his earliest known work. Pietro Paolo di Giovanni Marino was the prior of the Confraternita di San Nicolò da Tolentino, and he commissioned this panel for the confraternity’s chapel in Sant’ Agostino. The document in which he commissioned the work prescribes that it should depict the Madonna and Child with SS Sebastian, Peter, Paul and Dominic, with other saints, including St Nicholas of Tolentino in the predella. If the predella was ever painted, it was subsequently lost, while St Nicholas of Tolentino replaces St Dominic in the panel. Angelo di Bartolomeo, the rector of Santa Maria di Turrita, and his associates Evangelista di Cecco and Pellegrino di Francesco commissioned this altarpiece from Francesco Melanzio in 1485, but it took some time to complete: it is dated by inscription to 1488. It depicts the Madonna and Child enthroned with SS Sebastian, Fortunatus, Severus and Clare of Montefalco. Its predella, which was documented in the 19th century, has been lost. ✴SS Fortunatus, Louis of Toulouse and Severus on the right. It was originally used as a processional banner, and was probably commissioned during an outbreak of plague. St Fortunatus holds a model of Montefalco and the staff that he used to use to drive his oxen, which burst into leaf when he died. This panel (originally a processional banner), which came from the chapel of the Confraternita di San Nicolò da Tolentino in Sant’ Agostino, is attributed to Francesco Melanzio, the author of the signed work that came from the same chapel. Members of the confraternity are depicted among the kneeling figures to the left, which suggests that they commissioned the work. A lost inscription gave the date. The surviving inscription along the top of the frame identifies the subject as the Madonna del Soccorso (of Succour). As is usual in this iconography, the Virgin clubs a devil that tries to possess a child. A female supplicant (presumably the mother) kneels under the Virgin's protective cloak. This fresco, which is is attributed to Francesco Melanzio and dated by inscription, was detached in 1877 from a tabernacle at Camiano Grande, outside Montefalco. •the Coronation of the Virgin and the four Evangelists, in the dome. •the Holy Spirit with angels, in the dome. •the the Resurrection, in the dome. A surviving document records payments made to Francesco Melanzio in 1495 for frescoes in the Cappella del Presepio of San Fortunato (the 1st chapel on the left, which was then open to the exterior). This work was later lost when the walls were covered in plaster. A surviving document (1514) records the commission of frescoes from Francesco Melanzio for the Cappella della Beata Chiarella of Sant’ Agostino, which was demolished in 1714. ✴SS Cosmas and Damian, to the left. This fresco fragment on the right wall of Santa Maria Maddalena, which is attributed to Francesco Melanzio, was originally part of a larger fresco. This signed altarpiece on the high altar of San Leonardo, which is dated by inscription, is the masterpiece of Francesco Melanzio. 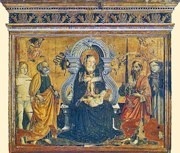 It depicts the Mother and Child with the kneeling SS Jerome and Francis and a number of other saints. The church belongs to an enclosed community of Poor Clares, but a photograph can be seen in the book referenced below (page 64). This documented altarpiece by Francesco Melanzio, which was painted at the time of the re-dedication of the church of San Rocco, was subsequently lost. ✴traces of figures of the Annunciation in tondi, above and to the sides. ✴SS Peter and Francis and the Lamb of God above. The church of Santa Maria delle Grazie was named for this much-repainted detached fresco fragment, which was rediscovered in 1769 and subsequently performed a miracle. 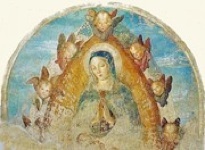 The fragment, which is attributed to Francesco Melanzio, probably formed part of a larger fresco of the Madonna and Child with SS Fortunatus and Laurence that was documented in 1713. It is now on the high altar. This panel from the church of San Felice di Giano, which is dated by inscription, is attributed to Francesco Melanzio. [It is now inside the abbey]. Francesco Melanzio signed an extensive fresco cycle (1510) in San Stefano, Picciche, outside Trevi, which is dated by inscription. The fresco fragments illustrated above, which are attributed to Francesco Melanzio, survive in a chapel off the right aisle of Sant’ Emiliano (the left apsidal chapel of the original church). This fragment of a fresco of the Madonna and Child, which is also attributed to Francesco Melanzio da Montefalco, is on the left wall. It is known as the Madonna della Colonna because it was moved here from its original location on a column in the original church. ✴the Madonna and Child enthroned, with St Sebastian, on the right wall. ✴the penitent St Jerome, to the right. The image of St Gregory is extremely close to that in Santa Maria di Piazza, Montefalco (see above), which suggests that the panel in Rome is also by Francesco Melanzio. This altarpiece, which is signed by Francesco Melanzio and dated by inscription, depicts the Madonna and Child enthroned with SS Joachim and Anna and two angels. It was documented in the sacristy of San Francesco in the 18th century. The panel was expropriated in 1811 and, on its return from France, was placed in San Salvatore in Ossibus (now San Pietro in Borgo), Rome. It was restored in 2006 and placed on the main altar of the Cappella del Governatorato dello Stato in the Vatican Palace. It is not available for public viewing. Return to Art in: Foligno Massa Martana Montefalco Trevi.